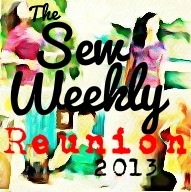 Before I start my post, I would like to thank everyone who contributed to the Sew Weekly Reunion 2013! As long as you finished your project, you are a contributor to the Reunion and you are all so awesome! Now it’s time to celebrate because you have sewed at least a challenge theme item, some of you three items!! !, and met the deadline! Woo hoo!